The 2019 General Assembly session is off to a running start. We can all be proud that Congresswoman Jennifer Wexton’s former seat in the Senate remained in Democratic hands. Congratulations to the new Senator from District 33, Senator Jennifer Boysko. I am extremely excited that the ERA resolution passed the Senate Privileges and Elections Committee on a vote of 8-6 with two Republican Senators joining the Democrats! This means that the entire Senate will have the chance to vote on the resolution. In previous years, the Senate has passed the ERA, so it is likely that the resolution will once again pass the Senate. A big “thank you” to the many advocates who turned out on the first day of session to show wide-spread support for the cause. You made a difference. Let’s hope that the resolution is passed out of committee in the House so the entire House of Delegates can vote on the resolution. I have a good feeling that Virginia will truly “make history” this year and pass the ERA. Governor Northam delivered his State of the Commonwealth address on the first day of session. It was a great experience to hear the Governor articulate policies that truly reflect our values. He emphasized the need to increase teacher pay, to provide for mental health services in our schools and to keep communities safe through better gun safety laws. I am particularly proud to carry Paid Family Leave legislation that Governor Northam has endorsed and committed resources to implementing. Our proposal includes a tax credit to small businesses to help offset costs associated with the program. This proposal enables families to better achieve a work-life balance. Solar Freedom: I am proud to be a co-patron on SB 1456. This bill promotes the establishment of distributed solar and other renewable energy. It removes the 1% cap on the total amount of renewable energy that can be net metered in a utility's service territory, authorizes third-party power purchase agreements for all customer classes, and allows local governments to install solar or wind facilities of up to five megawatts on government-owned property, among other things. Non-Partisan Redistricting: I am hopeful that language creating an independent redistricting commission will pass this year. Such a bill would have to pass two consecutive General Assembly sessions with an election in-between before the referendum question could be placed before the voters. It is certainly time that Virginia, a state known for “Good Government,” steps up and backs a system that enables voters to select their representatives rather than the other way around. I am convinced that non-partisan district lines would make compromise easier and require lawmakers to operate more in the “center” on controversial issues. This would better reflect the political views and values of most Virginians. 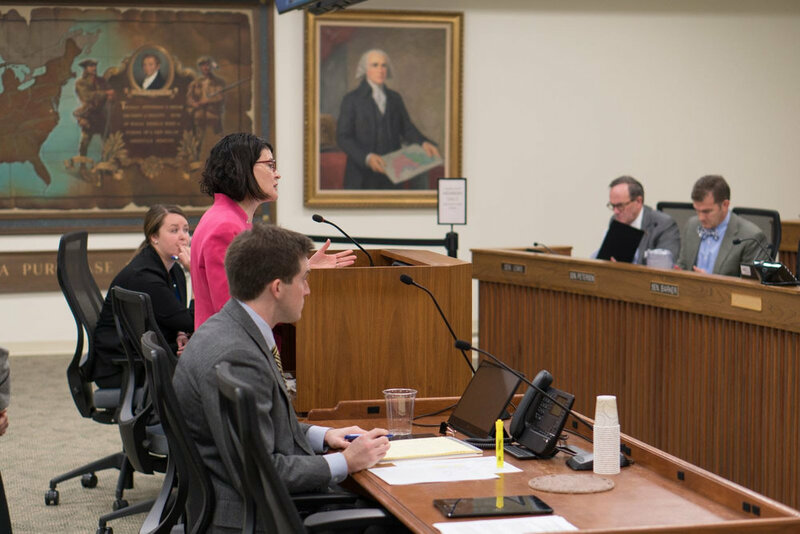 I am proud to say that two of my bills have passed out of the Public Education Subcommittee unanimously, and are on their way to garnering full committee support. SB 1141 would require the Department of Education to create age-appropriate curriculum guidelines for human trafficking prevention classes in the Family Life Program. I am very excited that this bill passed its first hurdle. The Sexual Assault Advisory Committee that I chair learned about a model program on this topic in Prince William County. One successful outcome of that model was an increase in the number of middle school students seeking counseling services and sharing information about friends who were vulnerable to gang recruitment and trafficking practices. SB 1142 directs the Board of Education to establish a committee to study the role of public school employees in providing health care services at schools and the need for training associated with the delivery of health care services. The bill was supported by the Virginia Education Association, a number of school systems, and groups representing school principals. It is important to determine what role is appropriate for schools to play in the delivery of healthcare services. My bill SB 1134 allowing schools to classify behavioral analysts as support personnel was referred to the Finance Committee, even though there was no fiscal impact associated with the bill. My bill provides additional personnel options for localities to utilize in improving outcomes for students. The decision to apply the classification would be at the discretion of local school systems and the funds to pay for the behavioral analysts would come from the “support personnel” appropriation allocated to the schools. Visitors stopped by my office this week to advocate for many issues, including the ERA and non-partisan redistricting, both of which I passionately support. It is a pleasure to serve you and I look forward to moving Virginia forward.